People buy Electric Grills because of the convenience they offer; you can take them outside with an extension cable, and also use them inside the home safely. 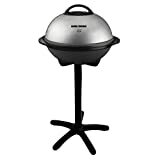 The best Electric Grills are easy to operate, easy to clean and cook great food no matter what time of year it is. Sure, you don’t get what is known as the ‘traditional’ outdoor cooking experience you might receive from a Charcoal Grill, but choose the right one and you will get an excellent taste. In this review I’ll be discussing the George Forman GGR50B, letting you know what it does well, what it does badly, and ultimately I’ll be letting you decide based on its performance under my tests, whether it’s the right one for you. Temperature levels rather than specific heat readings. It’s a pretty attractive design actually. You get a simple bowl-shaped cooking area on a stand and while I’ve been critical of these tall standalone grills in the past because they tend to blow over in the wind I was happy to find the GGR50B was quite sturdy. A key advantage of standalone grills is that you don’t need anything to place them on when outside so convenience and portability are equally present. The measurements are 22.20 inches by 20.51 inches by 12.99 inches so you get a reasonably large cooking area on a grill that doesn’t take up much space. The weight is 22 pounds and this is the best thing about the design because we’re talking low end of the weight spectrum so it’ll be very easy to transport outside or even to a friends house for a cookout. It’s not beautiful, but it is practical, and it gets the job done. It’s a very easy set-up because the GGR50B basically comes in 3 pieces: the pedestal, the bowl, and the lid. You’ve got the simple task of putting these together and then you can get started. To take it indoors, simply remove the pedestal and you have an indoor grill. The whole assembly can be done in under 10 minutes, which is about the time-frame most indoor/outdoor portable users are looking for. If you’re also looking for immense space in the 400-600 square inch range, then the GGR50B isn’t the grill for you. But, buyers who need all that cooking space will be in the market for heavier backyard grill anyway. Buyers of indoor/outdoor electrics tend to want to sacrifice some space for the added convenience they offer, and for the simple operation. And, as it stands the GGR50B is quite large for an indoor/outdoor, giving buyers 240 square inches of space which is more than enough to feed a family quickly. As usual with the George Forman brand, you get the sloped grilling surface and the advantage of this is that fat and juices drip off into the drain. It works pretty well, draining off most fat and debris, so I think it would be fair to say the GGR50B is a healthier alternative to other grills that don’t perform this function quite as well. Another plus point was the domed lid, which effectively allows the GGR50B to double as a steamer for vegetables and as a slow cooker for foods that need a little more time like halves of chicken. Simply place the lid over the food, open the vent and you’re set. So, unlike most lightweight indoor/outdoor grills, the GGR50B places hardly any limitations on what you can make for dinner, making it a great all-around choice. They didn’t design the temperature gauge quite as well, but I’ll let you decide its merits. Instead of giving specific temperature readings you get temperature levels 1-5, with most foods being cooked on levels 3-4. I personally like to see the exact temperature I’m cooking food on, but I also appreciate that temperature levels make the GGR50B very easy to operate; it’s as easy to operate as a Toaster or Kettle. The food I produced when I used this grill was excellent, and many buyers will love the fact that all foods can be grilled on just five heat levels, but I’d have liked to see specific temperatures too. Cleaning is incredibly easy as it always is on George Formans because they give buyers a removable grill plate that can be easily washed in the sink. Don’t wash in the dishwasher because it’s not dishwasher safe, but sink cleaning is a case of pouring boiling water over the grill top and debris literally falls off. You’re looking at a 5-minute job because the surface is completely non-stick. For buyers who don’t have a big enough sink for 240 square inches of cooking surface; you can take the grill top outside and use the boiling water there. While you don’t get the taste of charcoal grilling, you do get beautiful flavor, excellently cooked food and a domed lid that expands the horizons of what you can cook compared to other portable indoor/outdoor grills. You can cook anything on the GGR50B, and this is possibly its biggest selling point. I’d have liked the see real temperatures displayed, but beginners and intermediate level grill buyers will love the simplified level-based heat control. 240 square inches is above average for an indoor/outdoor costing below $200, the food quality is there too, making the GGR50B a force to be reckoned with in the budget grill market.